Today is the day. 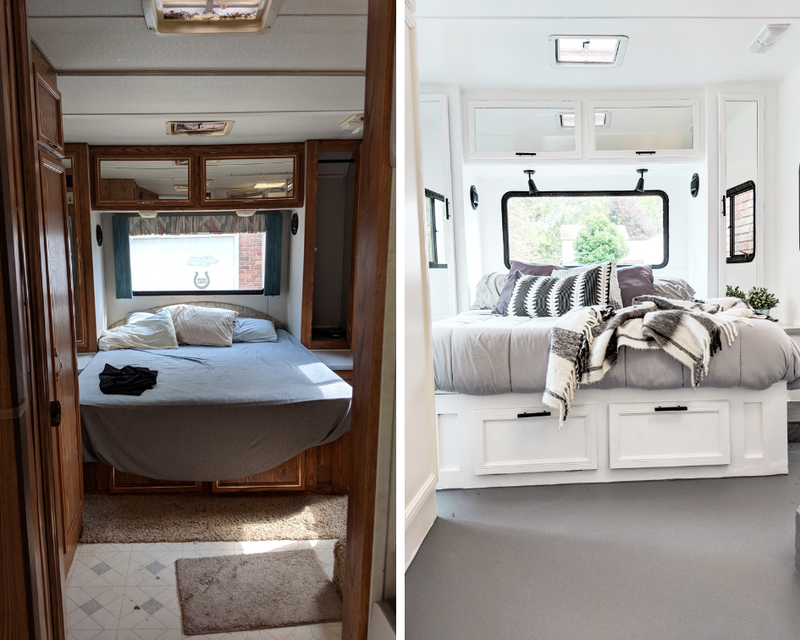 I’m sharing all the amazing “before” and “after” pictures from our latest camper project! We started with a 16 foot vintage camper and have slowly upgraded as our family has grown. 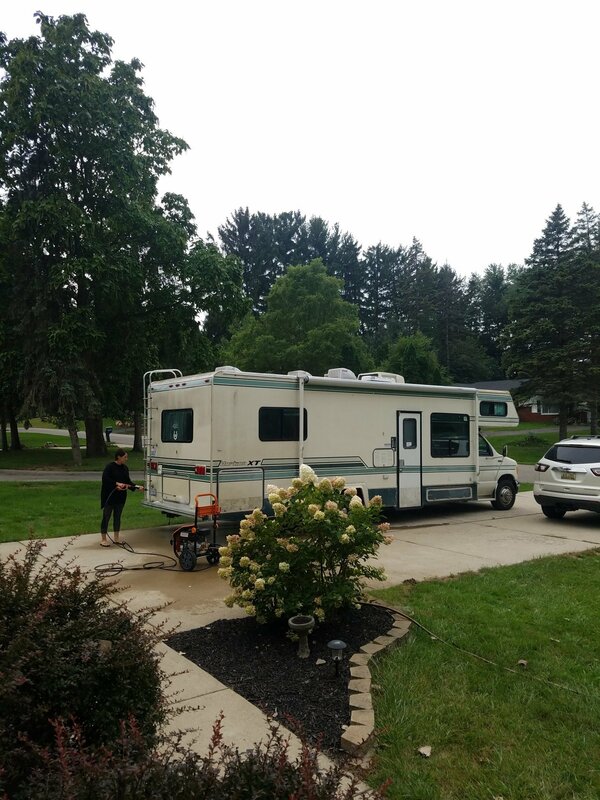 My husband looked at me one day and said “I think I’d like to try an RV instead of a trailer.” I knew in that moment that our next adventure was about to begin! The adventure of RV ownership brings a lot of challenges and lessons to learn. Driving and maintaining an RV is different from pulling a trailer in so many ways. Next Post: Our New Zip-Up Bedding! Beautiful Reno job. How much did the renovation end up running you? Thank you! Our budget was $2,000 – I’ve been meaning to write a more detailed price breakdown, but we were pretty close to that number once we bought all new tires and had a couple mechanical things fixed. Looks great. We just purchased a 1997 travel trailer. I will be doing a makeover on this bad boy this summer. Hi! We are looking to purchase a class C almost identical to this. For the same price. For all that you have done, how much did you end up spending on renovation alone? It’s SO beautiful! How does the rolled vinyl floor hold up for you? Was it easy to install? What did you end up doing with the front cab? Did you replace the seats? Did you install back-up cameras? Hi Leslie! We removed the seats so we could lay new carpet (I got a role of indoor/outdoor carpet at Home Depot) then we used an upholstery steam cleaner on the seats and put them back in. They weren’t in terrible shape, just dirty. I’ve been keeping my eyes open for new ones maybe from a junk yard? I’ve also looked into seat covers on Amazon. We found that it would be expensive to install a backup camera, but we found a magnetic one that runs off of an app on your phone! I’ll try and find the link for it and post it soon. Did you replace the ceiling, if so with what or did you just paint it? I must say im so impressed with the way your RV turned out!!! We recently just bought a 2003 36ft class A and even though it is in excellent condition and super clean, it is super dated and ugly colors and decor. I want to paint all the cabinets white. I saw were you put the type of Behr paint but I was wondering did you put any kind of sealer over the top to keep them from scratching ? I’m so inspired to redo ours now that I saw yours!!!! Thanks!!! Did you repaint the black on the windows? If so, HOW did you do it? I power washed them all first and then painted the whole camper before I noticed that there were a few little spot of black that needed touch up. I just used a black exterior paint and a little touch-up brush (like a kids paint brush). It blended well and didn’t need to do everything, just a few spots here and there. I think we are secretly sisters. I just ran across your blogs and I have read like 8. You are awesome thank you for the inspiration! God bless! Love the job you did! What kind of paint did you use on the out side? Wow…you did an amazing job. 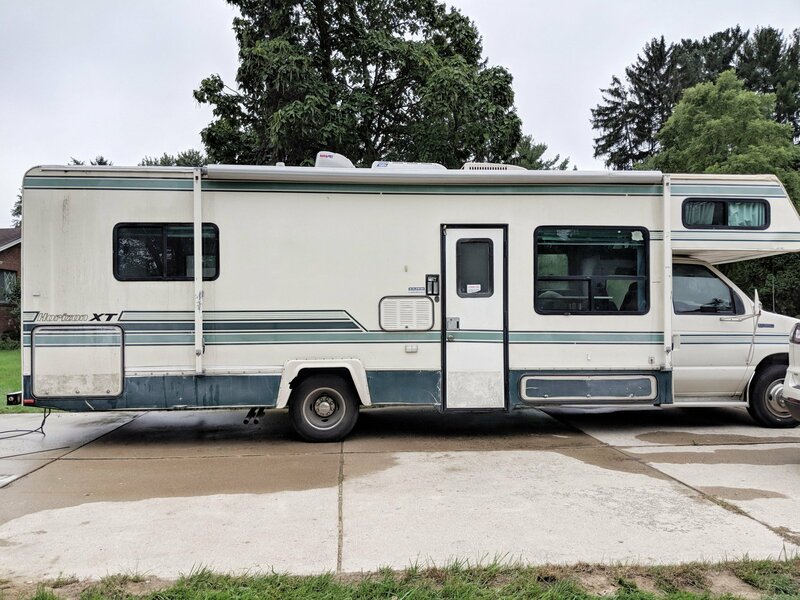 I want to attack (renovate) our 5th wheel. Seems overwhelming, but would love to paint all the wood white also. Can you tell me if it was totally tough project and would you do it again? What products did you use,? Thanks so much!